The Montana House and the Glacier National Park Fund are pleased to co-host another in the series of “Look, Listen & Learn” Centennial Speaker Programs held at the Montana House this year. Doug Chadwick will be the featured speaker. 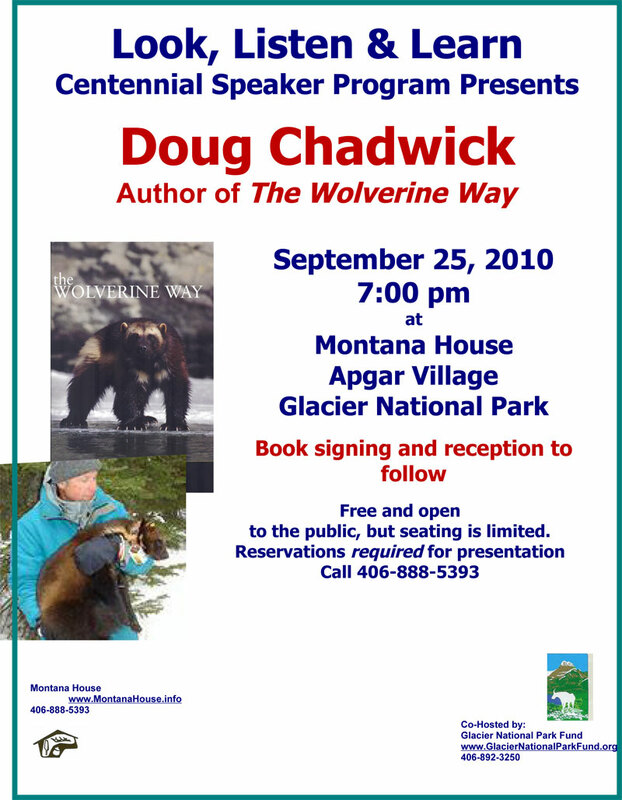 The event will be held at the Montana House in Apgar Village on Saturday, September 25th with the presentation at 7:00 p.m.
Chadwick is a Montana-based wildlife biologist who has studied mountain goats and grizzlies in the Rockies, elephants in Africa and whales in the world’s oceans. He has written hundreds of articles for national magazines and 10 books on natural history and conservation. 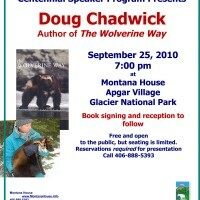 His topic will be his volunteer position on the five-year study in Glacier National Park with the Glacier Wolverine Project and his resulting book, The Wolverine Way. “Glutton, demon of destruction, symbol of slaughter, mightiest of wilderness villains,” the wolverine comes marked with a reputation based on myth and fancy. The book describes dealing with blizzards, grizzlies, sheer mountain walls and other daily challenges to survival, while trapping and radio-tracking these enigmatic animals, who turn out to be more complex than the legends. The project discovers key missing information about the wolverine’s habitat, social structure and reproduction habits. Wolverines, according to Chadwick, are the land equivalent of polar bears, in regard to the impacts of climate change, and time is important to protect those that remain. There are only 40 to 50 wolverines in Glacier Park, but it is nevertheless the single largest, most significant concentration left in the lower 48 states. They were common in the 19th century across the northern states, but now are confined to a few remote parts of Montana, Idaho, Northern Wyoming, and a few in Washington. They total no more than 500, but more likely number just 300 or fewer left in the lower 48. This event is open to the public with no cost to attend, but seating is limited. Therefore, reservations are required, and seating is on a first come basis. Please call 888-5393.